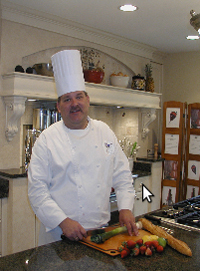 John Bogan - Lake Geneva's Super Chef and Culinary Extraordinaire! Chef John Bogan had his taste buds spiked as a youngster, when he was coerced by his uncle in the mid 1970s to help work in his restaurant in Spring Green, Wis. While most 12-year-olds enjoyed swimming and playing,young John Boganspent his summer vacation as a junior cook, regularly putting in a 12-hour workday. "It was a great experience that I'll never forget," said Chef John. "I knew right then and there, I loved cooking for people and would someday work as a chef." His instincts were correct; for over 30 years, Chef John has delighted the taste buds of connoisseurs of fine food and fine wine. After 15 years of successful cooking at the French Country Inn, Chef John pursued change. Learning that the Lake Geneva School of Cooking was for sale, he purchased the school and took over all operations in July 2008. Since then, the school has been transformed into a learning center of culinary art, offering year-round cooking classes, as well as corporate team building catering and a venue for private parties. 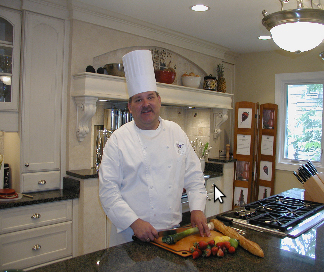 While educating his students on the essentials of culinary art, Chef John provides a rewarding, hands-on learning experience and allows participants to develop their own creative cooking talents. Using a variety of locally-supplied meats and produce in his menus, Chef John takes pride in helping to sustain local farmers and businesses. For instance, on Thursday mornings, Chef John takes his Farmers Market class to the Lake Geneva Farmers Market, where he hand-picks fresh fruits and vegetables to create a healthy three-course meal. However, Chef John goes beyond simply feeding his guest. Through his insightful, humorous and knowledgeable instruction, one will gain a greater appreciation for the art and love of cooking. For example, his hands-on Thrill of the Grill class is so popular that cooking enthusiasts drive for hours from Illinois and Wisconsin to learn Chef Johns grilling secrets and techniques. Chef John's menus combine French and American cuisines with Hawaiian touches. A longtime favorite, Shrimp Briana Kaiulani--shrimp crusted with Macadamia nuts, basil olive oil, fresh lemon juice, and Parmigiano and Reggiano cheeses--is a remarkable dish with Hawaiian flare. This is a great recipe for cooking enthusiasts who hope to impress their next dinner guest, or professional chefs who want to expand their culinary expertise. In an attempt to allow families to expand their culinary expertise, by design, Sundays at the school feature Family, Friends and Brunch and Sunday Family Suppers. Its my attempt to help get people together. For generations families have gathered for good food and conversation on Sundays, said Chef John. Weve taken that theme and created menus that simplify their Sunday meals. I feel good about that as a chef and as a person. Johnson and Wales University, Providence, R.I.